These treats not only made my boys pretty happy, but my coworkers definitely enjoyed them too. It also gave me a great reason to use some fun packaging I had. 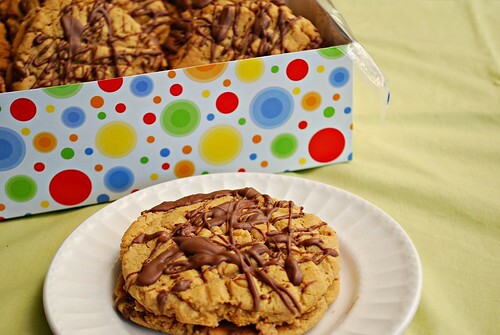 These make a great baking activity with little ones and everyone can participate. But we all know the best part... it's eating them once they're ready! Prepare your cookies as directed or using your favorite recipe. Divide the cookie dough into 12-16 even sized balls. Moisten your hands with a little water and flatten each cookie into 2 inch rounds. Bake as directed on the packaging or per your recipe. Remove from the oven and transfer cookies onto a cooling rack. Meanwhile, prepare the filling by combining the peanut butter and butter into a microwave safe bowl. Microwave the mixture until melted - about 30 seconds on high. Whisk peanut butter and butter and slowly mix in the powdered sugar. Once the cookies have cooled, pair them up by similar size. Place one teaspoon of the filling into the middle of one side of the sandwich and place the second cookie on top. Twist the cookies together until the filling pushes to the cookie edges. Repeat until all cookie sandwiches have been made. 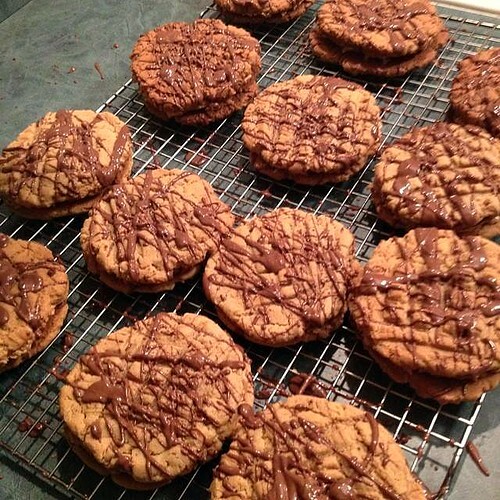 When all cookie sandwiches have been made, melt the chocolate melts as directed on the packaging and with a fork, dip into the chocolate and drizzle chocolate over the cookies. Allow chocolate to harden and dry before serving.